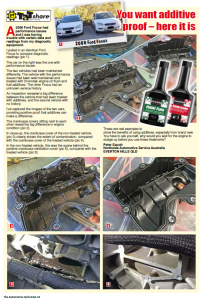 In a side-by-side comparison of two identical 2006 Ford Focus vehicles, a Queensland mechanic recently demonstrated how Envirotek engine oil flush products can make a big difference to the condition and performance of your vehicle. Here at Envirotek we’re proud of the high quality automotive vehicle additives we produce. We’re also confident that you’ll agree that the findings from the case study below – as published in The Automotive Technician – are compelling! To view Envirotek’s full range of products for mechanics, workshops and dealerships click here. Why Should You Use Engine Oil Flush Products? The following case study is from mechanic Peter Eacott of Northside Automotive Service Australia, in Brisbane’s Everton Hills. “A 2006 Ford Focus had performance issues and I was having trouble with certain data and readings from my diagnostic equipment. I pulled in an identical Ford Focus to compare diagnostic readings. The car on the right was the one with performance issues. The two vehicles had been maintained differently. The vehicle with the performance issues had been well maintained and treated with Envirotek engine oil flush and fuel additives. The other Focus had an unknown service history. An inspection revealed a big difference between the vehicle that had been treated with additives, and the second vehicle with no history. I’ve captured the images of the two cars, providing positive proof that additives can make a difference. The crankcase covers sitting next to each other reveal the big difference in engine condition (pic 2 in PDF). In close-up, the crankcase cover of the non-treated vehicle (pic 3 in PDF) clearly shows the extent of contamination, compared with the crankcase cover of the treated vehicle (pic 4 in PDF). In the non-treated vehicle, this was the scene behind the positive crankcase ventilation cover (pic 5 in PDF), compared with the treated vehicle (pic 6 in PDF)”. Click here to read the full story from The Automotive Technician here. Republished with full permission from The Automotive Technician. Envirotek has created an extensive range of automotive products that not only protect your customer’s vehicles but also are kind on the environment. Huge range of high quality products. With more than 15 impressive automotive petrochemicals in our range, you won’t be disappointed with Envirotek. Products designed specifically for the automotive industry. Envirotek products are highly sought after in the automotive industry. We sell direct to mechanics, workshops and dealerships. Improve performance and minimise contamination issues. By keeping new oil clean and maintaining better condition of the engine for longer. Click here to find out more about Envirotek’s Engine Flush product. Online ordering available for mechanics and servicing centres. Envirotek products are specifically developed to clean and restore the engine to its original condition with results benefiting both your vehicle and our environment. Our full range of automotive products and additives include Diesel Conditioner, Diesel Power Boost, Engine Flush, Enviro Air, Fuel Power Boost, Fuel Additive, Fuel Injector Cleaner, Fuel System Cleaner, Oil Booster, Power Steering Conditioner, Power Steering Flush, Radiator Conditioner, Radiator Flush, Radiator Stop Leak, Transmission Conditioner and Transmission Flush. Got a question? Call us on 1300 584 665 or contact us here. To become an Envirotek distributor, apply here. Envirotek market a full range of automotive petrochemicals that are different to our competitors. We are known for producing high quality products that are used extensively in the automotive industry.